As geeks, many of us enjoy creating, building, and fixing things. Below is a list of some of the things we use to make our lives a little easier. This compact and well built tool kit is the perfect gift for the DIY geek on your gift giving list. Hardened tool steel bits, a solid and durable ratchet, screwdriver handle, and an extension have made this my constant DIY companion. The hardened steel bits and sockets are built to take the abuse of an impact driver. I know they aren’t cheap, but mine has stood up to a lot of use both with the hand driver and in my impact driver with no signs of stripping out the bits. TailGater is great for anyone who finds themselves outside in need of a place to put down their tools, drink, or food but nowhere to put it. Just slip the TailGater over your standard size tire and you are all set with a table to use for whatever you need. Need a place to set your tools while you work? All set. Going to the beach and need a place to keep your food from getting all sandy? TailGater has you covered. Whether you’re bringing your lunch to work, packing for a picnic, or carrying the inevitable kid snacks with you, ECOlunchbox’s Blue Water Bento collection or products are a perfect option. Made of 100% stainless steel with silicone lids, these containers are leak-proof, ocean-friendly, and dishwasher safe. The Seal Cup Trio is a set of three different-sized containers with lids that nest inside each other for easy transport and storage when empty. The small holds 8 ounces, the medium holds 12 ounces, and the large holds 20 ounces. The bottoms of the containers also include the tare weight of each container and container+lid, to make it easy to maintain portion control. There is no plastic in these babies. If you need additional sizes or containers, you can also get them individually, plus the Seal Cup XL for larger portions or salads and the Seal Cup Mini, ideal for dips and dressings. They are also super durable and will last seemingly forever, which makes them a good investment for your food-carrying needs. But how leak-proof are these? I filled them with liquid and then shook and prodded and jiggled and turned them at every which angle and not a drop escaped. There’s not much more classically DIY than baking. Step back a bit in time with The Vintage Baker and try out some spruced up classic baking recipes. It’s got breakfast foods, cookies, pies, cakes, refrigerator desserts, and confections to sink your teeth into and dazzle your family with this holiday season. Some are pretty simple to make, while others are more involved and sophisticated. I mean, who doesn’t love chocolate cake with sea foam frosting? Or Peanut Butter Custard Pie? This year, try a DIY project that you can eat! Read my review here. Seriously the only tool you need in your pocket. The one thing I found myself reaching for over and over again this past year was my Leatherman Skeletool. The bit driver (with four different heads included) is just the right size for disassembling just about anything. The combination needlenose pliers, regular pliers, and wire cutters come in very handy when dealing with electrical connections in your home. The 4-inch knife (with straight and serrated edges) will tear through any packaging or packing tape… or anything else, really. I found myself having to be very careful using the knife. It’s a lot sharper than I anticipated. And the bottle opener is the one tool you’ll always appreciate! Leatherman has recently introduced a Coyote finish for their tools. It’s nice and subtle, perfect for someone who doesn’t want to carry a blingy hunk of stainless steel in their pocket. As an added bonus, the matte finish makes the tool easier to handle. Important for when you’re sweating bullets because you’ve made a mistake during your smart thermostat install. Can we fix it? Probably. It’s been said that a poor craftsman blames his tools, but without the proper gear, it’s painfully easy for routine maintenance of your favorite tech to unintentionally result in further damage to your priciest and most beloved devices. If someone on your gift list has mobile phone repair or gaming system modification on their mind, the Oria 76-in-1 Repair Tool Kit is sure to please. In addition to its core 56-bit magnetic screwdriver—including bits from tiny jeweler’s flat and Philips heads to Torx, hex, and even Nintendo’s famed tri-wing—it also boasts tweezers, spudgers, a SIM card ejector pin, an anti-static wrist strap, and much, much more. In short, it’s everything the burgeoning hardware hacker needs to get into (and back out of) that hot new holiday gadget quickly, safely, and efficiently. A handsome modified Switch in Smoke Black with matching Joy-Cons. Compared to the screen-printed graphics on the new Nintendo Switch special edition Diablo III and Pokémon: Let’s Go consoles, those original systems look a little… uninspired. But why settle for a limited edition design when you can put together a custom-colored Switch that’s all your own? Basstop’s replacement products run the gamut from simple console housings—I was easily able to swap mine out using the aforementioned Oria screwdriver kit—to the (obviously more advanced) Joy-Con shells with genuine d-pads! From Matte Clear and Smoky Black to translucent greens and reds and even that fan-favorite, Atomic Purple, you can surely find a color combination to suit your personality. Everyone needs great tools, but starting out in the world of 3D printing can be expensive and confusing. Many low-cost printers don’t come assembled, and are a hurdle right from the beginning. The Monoprice Select Mini 3D printer, however, comes pre-assembled and tested for quality assurance. Version 2 is an upgrade from our previously covered v1, and is a step up, while the price has actually decreased. The package also includes various tools, filament, and pre-installed patterns, meaning your geek can print immediately out of the box. The Select Mini also features a heated bed paired with a high-temperature nozzle, allowing you to print in a huge range of plastics, wood, and metal composites, and both conductive and dissolvable PLA. This model is ideal for entering the 3D printing world without breaking the bank. A key part of this is buying a 3D printer which can be easily maintained. The Monoprice Select Mini 3D printer v2 uses common industry standard parts, and is easy to repair for newbies who might be a bit hard on their equipment while they learn. 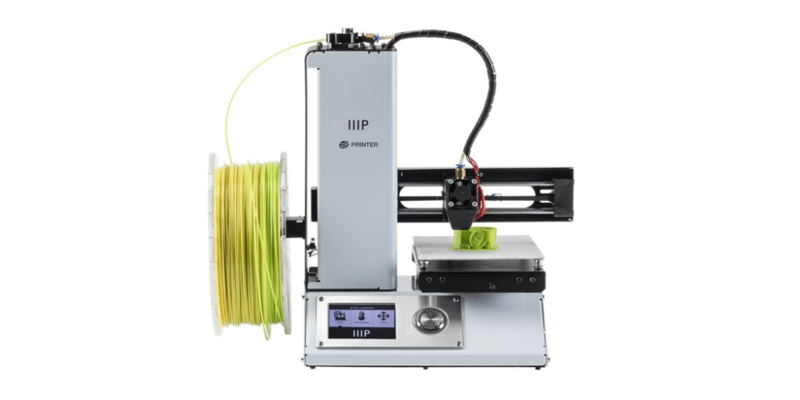 The Monoprice Maker Ultimate 3D printer is a top-of-the-line home printer for your geek who wants to kick their hobby up a considerable notch. Most notably, the Ultimate can print to resolutions of 20 microns (0.02 mm), which is a better resolution than most “high definition” printers on the market. Better still, it prints at the same speed as printers with lower resolution, so your geek won’t have to wait longer still for the sake of quality. We’d also like to add that the Ultimate is quieter than most models, making it suitable to use in an office or at home. The Ultimate works with most major 3D printing software, and can print with the following materials: ABS, PLA, XT Copolyester, PET, TPU, TPC, FPE, PVA, HIPS, Jelly, Foam, Felty. The sheer range of options is clearly an advantage and means that whatever your geek wants to print, they will have the tools at their disposal, all in one fine gift. The CompuCleaner 2.0 is a mains-powered air duster that can be used to clean the inside of your computer and other electronics safely. It can be used as an alternative to the compressed air cans that many of us use and comes without the risk of liquid accidentally spraying from the can into electronics. It can also be used to clean intricate ornaments, although bear in mind that it is more powerful than ordinary compressed air before blasting it at precious heirlooms. The CompuCleaner 2.0 comes with three shaped nozzles for cleaning different items and has a nine-foot-long cord so it can be easily used around the house. Keep your computer clean and safe while reducing waste going to landfill by avoiding purchasing single-use compressed air cans. An ideal gift for computer nerds and those who love to keep their electronics in pristine condition. DijiTape is a digital tape measure that will help the DIY fan on your holiday shopping list make more precise measurements than ever before. The tape measure comes with an inbuilt screen that shows your current measurement in five different units—feet, centimeters, feet and inches, inches (decimal), and inches (fractions)—so you can choose the best unit for the job. The DijiTape can also hold your previous measurement, save up to two measurements in its memory, calculate the midpoint of your current measurement, and allows you to choose whether to measure only the length of the extended tape, or whether to include the length of the device itself as well. While significantly heavier than a standard tape measure, the DijiTape will be invaluable when very precise measurements are called for and is an excellent tool to add to any handyman’s kit this holiday season. The Ender 3 from Creality is is a very capable and inexpensive 3D printer. The printer arrives partially assembled in a surprisingly small box. Assembly was simple with reasonably clear picture instructions reminiscent of LEGO. From the time we cracked the seal on the box to the time the first print started was less than one hour. You can pick one up from Amazon, shipped Prime, for about $230. If you’re not in a hurry the same model is available direct from China on AliExpress and the like for near $180.